Alabama's concealed- and open-carry laws and ensure law-abiding citizens have access to guns. Opposed by the Business Council of Alabama, it bars employers from prohibiting their workers from having loaded pistols in their vehicles while working. The law blocks employers from punishing workers for having weapons in their vehicles and allows employees to sue if they are punished. While the Alabama Legislature approved the law more than two months ago, law enforcement officers are still struggling to understand how it should be enforced, and some state officials say it needs clarification. "Law enforcement is still unsure of what the bill says," said Randy Hillman, executive director of the Alabama District Attorneys Association. In an effort to make sure the law is enforced "evenly and fairly," Hillman said they are attempting to conduct training with law officers. Though lawmakers who supported the law note that the Alabama Sheriffs Association and the Alabama District Attorneys Association supported the bill before its passage. But Barry Matson, deputy director of the ADAA, told law officers during a training session this week, that many parts of the law still need clarification. For example, the law says those with a conceal-carry permit can bring guns to sporting events sponsored by private or public schools and colleges, as well as professional sporting events. However, it also says that, without express permission, they cannot carry firearms in any building or facility that limits access of unauthorized individuals with guards and other security features such as turnstiles or metal detectors. That would include many college and professional sporting events. In those cases, the facility must display a sign stating weapons are prohibited. According to Sen. Beason, the law changes Alabama from a "may-issue" to a "shall-issue" state. To accomplish that, it requires county sheriffs, who are tasked with governing the issuance of conceal-carry permits, to issue such a permit within 30 days of the application. It also limits the circumstances under which sheriffs can deny a permit to a "reasonable suspicion" that the applicant would use the weapon unlawfully or in a manner that presents a danger to the public or the applicant. Other reasons to deny a permit specified in the law include evidence that the applicant is mentally diseased or defective, he or she falsified any portion of the permit application, was convicted of a violent crime, certain drug-related crimes or sexual offenses involving victims under the age of 12. Sheriffs must consider how recent any of those events occurred when making their decision. The law requires sheriffs to notify the applicant in writing of the reason for denying the permit. The law also provides for an appeal process, enabling applicants to seek a second opinion in the local district court, where the sheriff would bear the burden of proving the applicant should not be granted a permit. While the law prohibits employers from barring loaded guns from their property -- as long as they remain in a locked car -- it also holds them blameless for injuries or damages that may result. The law specifically states that employers shall be "absolutely immune" from any claim or lawsuit seeking damages that may result "directly or indirectly" from a firearm brought onto their property. It also specifies that the presence of firearms or ammunition does not constitute failure by the employer to provide a safe workplace and that employers have no duty to "patrol, inspect or secure." Firearms are still barred from government buildings, the grounds of detention facilities as well as the grounds of mental health facilities. Those with a conceal-carry permit can keep a loaded gun in their vehicles at work, but any person who can legally own a firearm may keep a pistol in his or her car as long as it is not loaded. In such cases, the gun owner must keep the pistol locked in a compartment or container that is affixed to the vehicle. 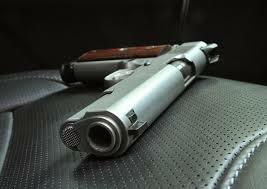 The firearm must remain out of reach of the driver and any passenger in the vehicle. Alabama law already allowed residents to have unloaded hunting rifles in their vehicles without a conceal-carry permit. Even before the new law, it was legal under Alabama and federal law to carry an unconcealed weapon in public. But the new law goes a step further, stating that it should be a "rebuttable presumption" that the mere carrying of visible weapon, as long as it remains "holstered and secured," is not a violation in and of itself. That does not mean law officers cannot stop and question a person for openly carrying a firearm. ADAA Deputy Director Matson told law officers during a training session this week that they could do so. Adding that part of his job was to put officers' minds at ease about the law, he said they still have the ability to stop a person legally if they have reason to believe a crime has been committed or public safety may be at risk. The law does not prohibit non-U.S. citizens from obtaining a conceal-carry permit and taking advantage of the new rights for gun owners. Sheriffs considering applications from those who are not U.S. citizens must conduct an Immigration Alien Query through U.S. Immigration and Customs Enforcement before issuing a permit. They must also obtain the applicant's country of citizenship, place of birth and any alien or admission number issued upon their entry into the U.S. The law does not allow undocumented immigrants to obtain a conceal-carry permit. Additionally, any person who resides in another state and posses a conceal-carry permit issued in that state is able to take advantage of the new law. If a person relocates from another state to Alabama and possesses a conceal-carry permit issued by their previous state of residence, their permit is no longer valid once they relocate.